Down & Out Books, 9781948235112, 242pp. Bricks and Cam are back, this time fleeing from the East Coast after closing accounts with the mob. Planning a new life on the West Coast, the pair of hit men stop off in Ashton, a small, rural town in eastern Washington, only to immediately find themselves embroiled in trouble in typical fashion. What starts in a bar as a simple intervention between an abusive boyfriend and his victim girlfriend quickly escalates into a blood feud between Bricks and Cam and the family of local backwoods royalty, the Crawfords. Once Bricks and Cam draw first blood, all of the force of the extended Crawford family and their militia-minded cohorts are brought to bear on them. The Crawfords have numbers and hometown advantage, but they've never gone up against anyone like Bricks and Cam before. Bricks' lethal cunning and Cam's penchant for successful messes wreaks havoc with the Crawford's attempts to bring them to small town justice. Despite their talents, though, the two big city assassins soon find themselves struggling not just to win this war, but to make it out of town alive. 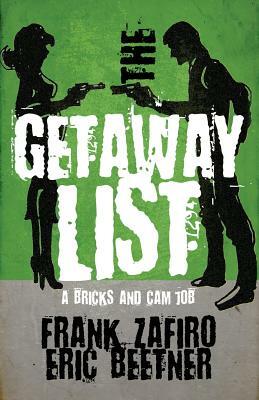 The Getaway List is the explosive final Bricks & Cam Job.